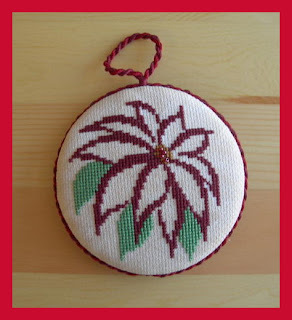 I was in Arizona visiting my daughter for Thanksgiving but did manage to finish this ornament from the current JCS Ornament Issue. Substituted Baby Spinach with Forest Glade. 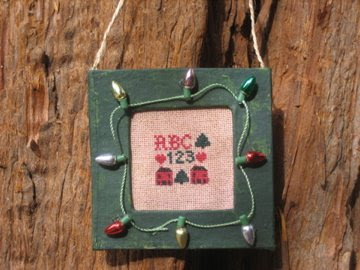 I stitched this little Christmas ornament for my cat loving son. 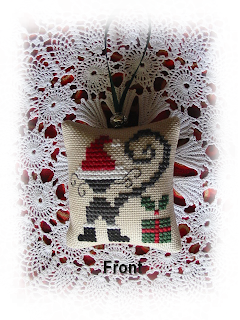 The design is by The Cat's Whiskers Design Studio, Krazy Kitties series. 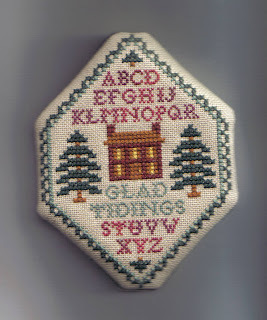 Stitched on 28 count Jobelan with DMC threads. 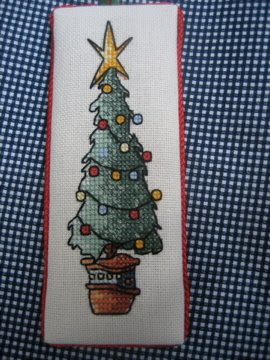 In keeping with the November theme, I stitched this tree from Michael Powell. Most of his freebies have been buildings - a lighthouse, churches and cottages - but his most recent was this tree. 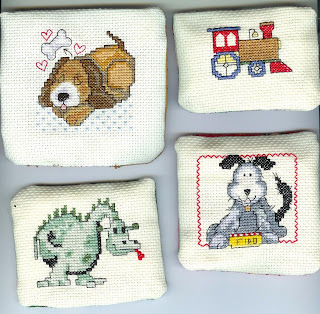 I have stitched a few ornaments recently so here's the ones I can show so far. 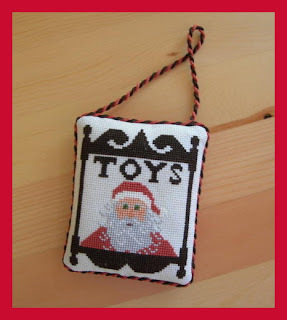 Here is my ornament for November. All I have left to do is put a hanger on it. 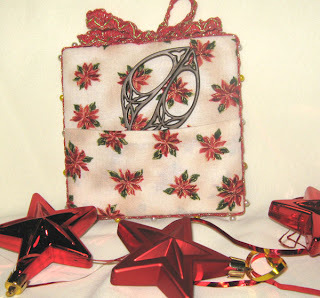 It is from the 2008 JCS Christmas issue. 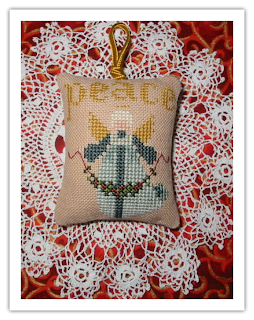 I've finished another ornament. 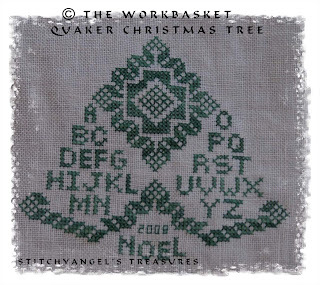 This the 1986 Freebie Amish Angel from Told in A Garden found here. 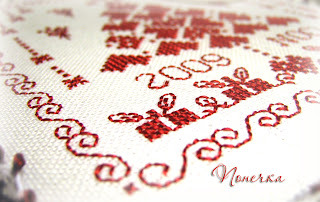 Stitched on 28 count piece of fabric from my stash with DMC Threads. 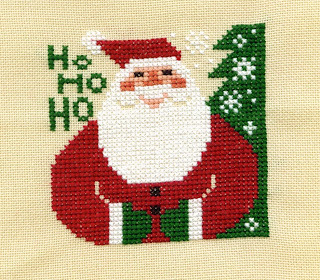 I have a couple more ornies to finish before Christmas, so I better get stitching. I made this beautiful star. Fabric: Cashel Linen 28 ct. 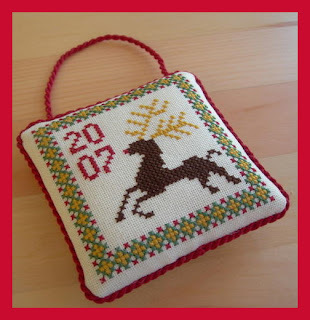 I stitched these 2 ornaments a few years ago. I just pulled them out and backed them with felt and added a hanger. 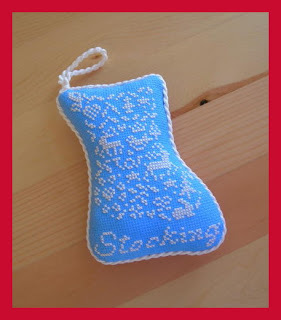 I finished another ornament this morning. 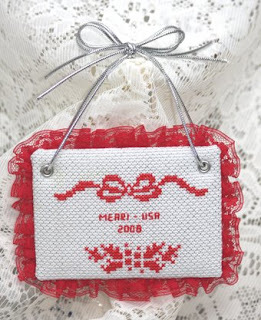 It's from the JCS 2008 Christmas Ornaments magazine by Blackbird Designs. 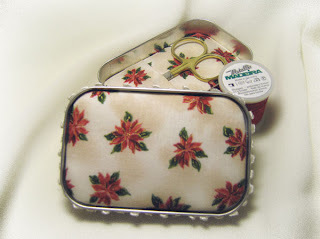 Stitched on 30 count Kortys Special Blend by R & R Reproductions with DMC Threads. It measures 3 inches wide by 3 & 1/2 inches long. 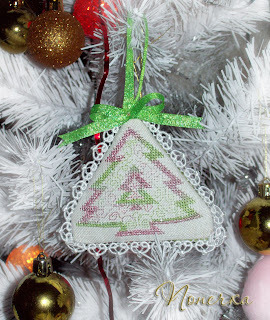 I hadn't stitched many ornaments in a while, but 2 weekends ago, I got the ornament bug. This is what was born from the weekend. The one in the upper left is from Prairie Schooler and the 97or 98 JCS ornie issue. 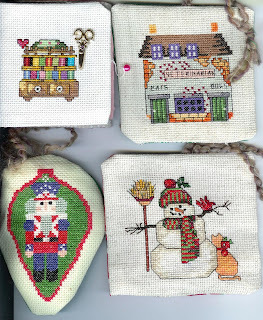 The upper right one is a Cricket Collection freebie from their website, and the one on the bottom is from LK Tiny Tidings from this year. The upper 2 are for exhanges. I think they all turned out really well. Thanks for looking! I got a bit behind in October, but have now caught up. 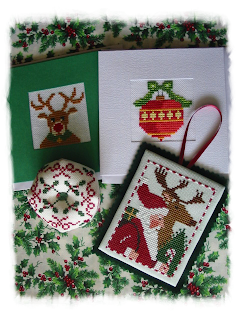 The Santa & Reindeer are by Prairie Schooler, Leaflet 151 'Santas & Snowmen', stitched on 32 count Jobelan with DMC threads. 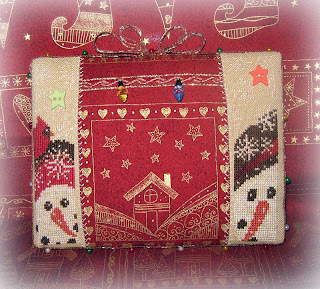 The Biscornu is by Cherished Stitches from the 2008 JCS Christmas Ornaments issue, stitched on 28 count Jobelan with DMC threads & Mill Hill Beads. 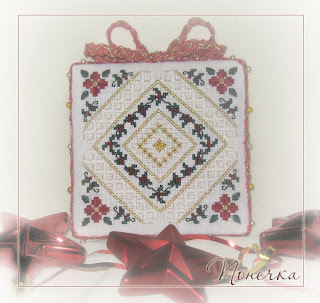 The cards are stitched on 25 count Evenweave with DMC threads and are freebies found here. 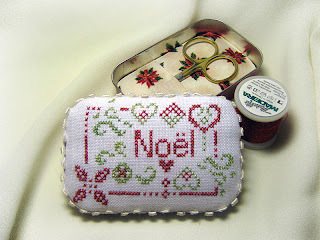 This is the 24th ornament I've stitched this year. 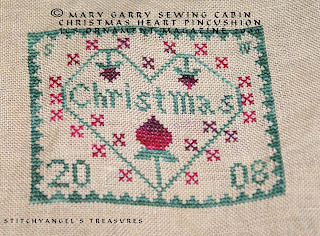 It was featured in the November issue of The Gift of Stitching Magazine. This was certainly a good year for my ornaments! so many made! most already mailed! and a few left for my own tree! have to make more now! 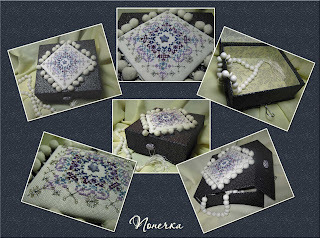 Think I need to add some beads and edging to some of these to finish them up! 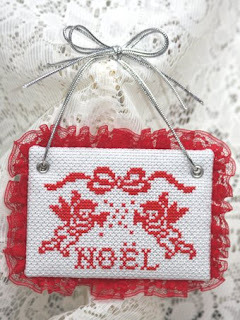 I have been busy stitching and finishing loads of ornaments for some personal exchanges and gifts for family/friends. This is my latest finish and probably my favorite so far. More pics and details on my blog. 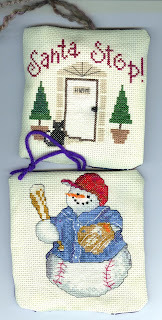 Here is my freebie stitching for the week. My name is Marion and I am from Germany. 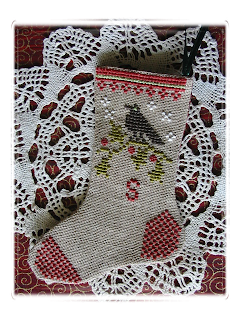 Here is the first Ornie I have made, the pattern is from Rico Design. 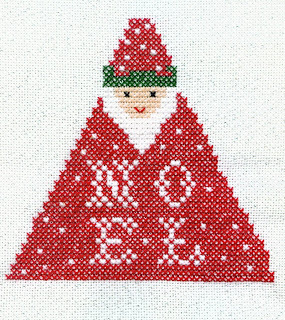 This precious little guy is from the November issue of The Gift of Stitching magazine. 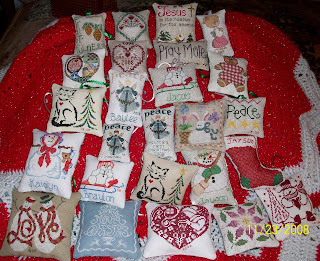 I recently picked up the ornaments I stitched earlier this year from my finisher and she did an amazing job! I can't wait to add these gems to my tree this year.